By far the most annoying thing we’ve had to put up with – to my mind at least – since the seniors’ untimely exit from this year’s championship has been the way so many have queued up to express condolences about the apparent death of football in the county. While the seniors’ championship defeat was, for sure, a major setback for us, the blow we suffered at Newbridge was far from fatal and today at Carrick-on-Shannon our U20s provided tangible proof that football in Mayo is far from finished. So, although the senior team won’t get the chance to grace the Croke Park turf this year it appears all but certain that Mike Solan’s young charges will. Following this afternoon’s 2-14 to 2-11 win over Derry in what was in every sense a rip-roaring All-Ireland semi-final fixture, the decider looks set to be fixed for HQ as the curtain-raiser to the Dublin/Roscommon Super 8 tie in three weeks time. In another intriguing twist, the final will be against Kildare who pulled off a major shock in the day’s other U20 semi-final this afternoon. The Lilywhite youngsters beat Kerry by a point to set up what should be a fascinating final against a county we’ll now be itching to get one over. Funny old world it can be at times. Páirc Seán is a place I hadn’t stood in since 2006 – the fine, compact stand that now graces the ground wasn’t there then – which makes the Leitrim venue the final county ground in Connacht I’ve seen a game in since the inception of the blog. If we ever draw anyone other than Galway in the Connacht championship I might even get to see a senior championship match there at some point. There was a decent sized crowd there this afternoon – around 2,000 or so, the bulk from our side of the fence – with most taking up station in the stand. That’s where Rob and I parked too – yes, seeing as you’re asking, there will be an episode of the Mayo News football podcast on the game, that’ll be online on Monday – and it was from that vantage point that we saw a real blood and thunder championship contest unfold. We struck first and with effect. Shortly after throw-in captain Ryan O’Donoghue pounced on a ball played into him, skipped past the cover, rounded the ‘keeper and walked the ball into the net. Derry responded well, though, steadying themselves with points from a free and a ’45. Tommy Conroy twice went on blistering runs down the left-hand channel but, while we got no reward on the scoreboard the first time, Ross Egan pointed a free when the man from The Neale had his second foray stopped by a foul. Suddenly, though, our early advantage was wiped out. Derry’s burly full-forward, Callum Brown, showed his marker a clean pair of heels as he accelerated in from the left wing and smashed home a superb goal. Paul Lambert belted over a super rejoinder for us but soon after we were cut open at the back again, the Oakleafers’ second goal pushing them three points clear. We were wobbling now but another Ross Egan free helped to steady us. We could have had a second goal ourselves but Conor Diskin – played in by Johnny Maughan – aimed a fly-kick at the ball from point-blank range only to see it career wide of the open goal. A Derry point straight after deepened doubts about how we were coping in this contest. We then had what looked to be very strong shout for a penalty turned down. By now both sets of fans were giving the ref loads but, to be fair to him, he was being consistent. Anything – and I mean anything – went, providing the player being tackled stayed on his feet. It made for a hard-hitting, physical contest but both teams saw this as a licence to play at the edge rather than well over it, with the net result that it was a real full-throated battle. With quixotic reffing thrown into the mix. We did get the odd free, though, and Ross Egan thumped over a marvellous long-range one to cut the deficit to two. Then Ryan O’Donoghue was hauled down as he tried again to squirm clear in the danger zone and Ross tapped that one over too. Oisin McLaughlin – who had a superb game today and was rightly picked out as the Man of the Match on Midwest – then raided forward and landed a screamer to level the match up. Seconds before half-time Evan O’Brien launched what at first glance seemed like a hit-and-hope effort which took forever to come back down to earth. When it did, though, it was down between the posts it came and we went in a point to the good. It was Derry, however, who took a hold on the game after the break. 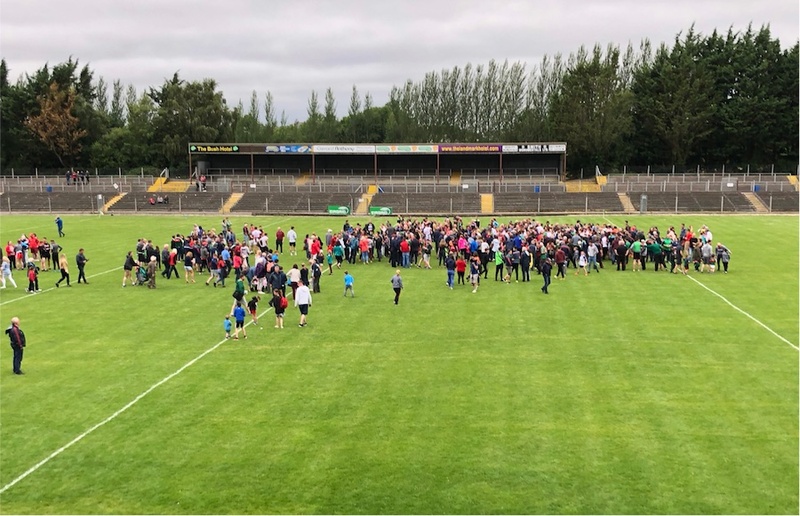 We’d struck first blood – when a Ross Egan free didn’t make the distance, Conor Diskin claimed it and fired over – but over the next ten minutes the Ulster champions turned the screw on us, with three unanswered points edging them a point ahead. But then the tie swung again. A clever, through-the-hands move ended with Paul Lambert shooting to the net and we were back in front once more. A long-range Ross Egan free stretched our lead to three as we now looked the likelier to prevail. But back came the gritty Oakleafers. A sumptuous outside-of-the-boot effort from sub Brian Cassidy, followed by a converted free for them, made it a one-point match once more midway through the second half. We got the next score – from Oisin McLaughlin – and the one after it too, this one from sub John Gallagher, who claimed the Derry restart, broke forward and fired over. Cathal Horan was then black-carded – harshly it appeared – with Joe Dawson coming on. Derry pointed a free but then narrowly missed a goal chance soon after when they cut through our backline with alarming ease. But then we got a gilt-edged chance to put the contest to bed. Ryan O’Donoghue was hauled down in the square but the Belmullet player’s spot-kick was superbly batted away by Derry’s ‘keeper Oran Hartin. We were still two up at that stage – with about six minutes to go – but that miss looked like it might tip the psychological advantage in this compelling contest in their direction. We kept our nerve, though, and claimed the next score, with Ryan O’Donoghue releasing John Gallagher – who was a real super-sub for us today – to fire over his second score. Roars of May-Oh! May-Oh! May-Oh! now rang out around the stand as the game entered injury time. Only a goal, it seemed, would save Derry. They damn near got one too, a rasping shot cannoning back off our upright and, in the scramble that ensued from the rebound, they got a close-in free which they pointed. It was all Derry now. Callum Brown was running amok out the field – Nathan Moran took one for the team just after the penalty, earning a black card for wrestling the Derry player to the turf to stop an attack – and our defending was getting more and more frantic. There was still another two minutes of injury time to play when Derry got their next point, to cut the gap back to one. They were doing all of the attacking, our lads looked out on their feet. Could we hold out? It didn’t, in truth, look like we would. But then the match took a final improbable turn. From the next restart we retained possession and eventually the ball was fed to Tommy Conroy. He took off at pace and then, when he got within range, coolly fisted the ball over the bar. From the kickout we got possession again. Again it was The Neale player who got it in the danger zone and again he had the good sense to play the percentages and settle for the point. Those two cool-headed scores saw us over the line, as we won by 2-14 to 2-11 at the end. It was a super performance, one which saw strong performances all over the field for us. The backline was under real pressure on several occasions but they coped well and both Paul Lambert and Oisin McLaughlin wreaked merry havoc on their repeated attacking thrusts. Evan O’Brien and Jordan Flynn both did well at midfield and, while Ryan O’Donoghue did damage for us, he was closely chaperoned throughout by the hirsute Eoghan Concannon. Nathan Moran, Tommy Conroy, Conor Diskin and sub John Gallagher all did well in attack, where Ross Egan contributed handsomely from placed balls. So it’s now onto the All-Ireland final for county’s young guns. Another huge test awaits Mike Solan’s charges then but this team showed today that they’re not a group that shirks a challenge, no matter how it’s thrown at them. Congrats to them on a cracking win today, one that provides a much-needed morale boost to football fans within the county. Mayo: Paddy O’Malley; Johnny Maughan, Brian O’Malley, John Cunnane; Paul Lambert (1-1), Cathal Horan, Oisin McLaughlin (0-2); Evan O’Brien (0-1), Jordan Flynn; Nathan Moran (0-1), Ryan O’Donoghue (1-0), Tommy Conroy (0-2); Conor Diskin (0-1), Ross Egan (0-5, frees), Colm Moran. Subs: John Gallagher (0-2) for Colm Moran, Joe Dawson for Horan (black card), Seán Og Tigue for Nathan Moran (black card). 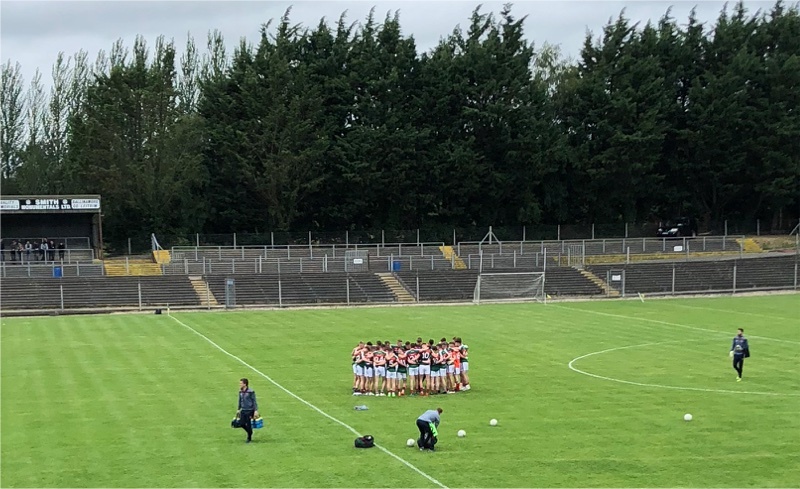 A quick word about the ladies who this afternoon overcame Cavan in a high-scoring encounter at St Tiernach’s Park in Clones. It’s been a very difficult week for ladies football in the county and the ructions in the camp of late meant that the team had the worst possible run-up to today’s match. Fair play to them, they responded to the challenge in the best possible fashion and today’s win now sees them set fair to make the knockout stages in the championship. As the saying goes, when the going gets tough the tough get going. Well done to them on a superb win today. Fantastic win. Just what the county needed. Lots of talent in that team, hope they go on now and win All Ireland in Croker! Great result, having to beat an Ulster ref as well who was an utter disgrace. Super performance by the two wing backs, Lambert and McLaughlin. Where are yea Jay. Come in Jay. You said you would be surprised if any of the other 3 remaining semi finalists could come within 10 points of the Kerry u20 team. We have a little score to.settle with Kildare and hopefully our u20”s will settle that one. Fair play to them and fair play to the ladies. Come in Jay, calling Jay. Come on and explain what happened to the untouchable Kerry team. I’m here , and I am still surprised. Kerry’s arrogance cost them today they thought the would win in first gear, showed no hunger or urgency until it was to late. I still think if the game was played again Kerry would win well. WJ hot the nail on the head regarding our defence. Our full back line or overall defensive structure needs to improve if we are to best a strong kikdare team. Derry had 4 goal chances in the 2nd half, two were flicked inches wide and two were saved by Paddy O M in goal. We coughed up too many chances and that’s one key area we need to rectify and fast. Despite conceding two soft goals in the 1st half we should have been further in front at HT. Diskin, OD and Egan were all beating their men but we didn’t finish enough of the opportunities thst presented in the opening half. Egan was good on frees and in play but faded a bit 2nd half. I was impressed with OD he played the captain’s role, even if he did miss the penalty he contributed well throughout. There’s more scoring in himself and Egan in the final. Diskin is strong and great for winning ball. I thought Colm Moran looked off today. He didn’t really feature. And Nathan Moran definitely has more in him. Did some good things but also some sloppy things. A guy like him can impose himself more on the game. Conroy was impressive when he did get the ba. He has pace and just went for goal every time. Overall in attack I think we showed plenty of potential and the raw material is there. Diskin and Egan couldn’t have been a bit more ruthless when charging down in goal but they’re young. It’ll come. We won the midfield battle. It’s as simple as that but I believe Kildare are good here so we’ll need a similar performance with Nathan Moran adding in here too. Our wing backs Lambert and McLaughlin has great games. I couldn’t really tell how Horan did at 6. But we left our full back line exposed a few times. This is where we looked most vulnerable. The boys back here fought bravely but rarely win 50/50 balls against a strong Derry full forward line. In the end we did enough back here to keep Derry out of the goal but we has some hairy moments. The small but vocal Mayo support got really behind our boys when the game was in the melting pot and it was a proud day to be a Mayo supporter. Onwards and upwards. Great to know that we will have a bit of silverware coming to the county on 5th August. Wj, I’m glad you have a reason to keep the blog tucking over. Well done to both the u20 lads and the senior ladies. To the ladies, please find a way to settle your differences for the moment and go out and win your title . To the u20 lads, please go out and don’t take no for an answer. Mayo, as a county need you guys to win this thing. To be honest Jay I’m surprised myself they got beaten. A big win for the Kildare lads and I hope it serves as a strong reminder to the Mayo lads that it will take a top performance to win the final. Fair play again to them. Really something to look forward to. Revellino…. Kerry people now turning on Jack OConnor. It’s being described as “a squandermania of talent “ on Kerry forums at the moment. That was enjoyable, little hard on the nerves in the second half but the team play with a real sense of attacking flair and just about deserved the win. I know Oisin got man of the match but I thought his club colleague Paul Lambert was the real driving force of the win today. Paddy O Malley – Couldnt really fault him for the goals and his kickouts were pretty good. Johnny Maughan – Struggled today, thought he should have been replaced albeit didnt have any real protection and huge space to defend. John Cunnane – Very steady throughout and what a pass for first goal. Very well done to U20 team. A great result and just what the County needed. Very surprised to see Kerry beaten in the other semi and no doubt they will have some good excuse. Feel sorry for poor Jack o Connor. Yeah right. Lovely for the lads to get to play final in Croker but to be honest the final should be at a provincial ground such as the Hyde or even Portlaoise. Also very well done to the ladies. Superb attacking display. I felt they played with great freedom and lack of fear today. Not sure how good or otherwise Cavan are so maybe shouldn’t read too much into the result but that team and management deserve great credit after such a difficult week. Super 8s didn’t look very super to me. Ross were disappointing though Tyrone in fairness were good. Dubs v Donegal was fair but Dublin’s possession game in last 10 minutes was puke football. Tessie Dolan seemed surprised at this tactic. Obviously he must have gone to toilet in injury time in last year’s AI final. Can anyone tell me if the black card has been shelved for the Super 8’s, a Donegal player was hauled down bearing on goal by a two handed pull back by Eric Lowdnes in the second half, no mention of this deliberate foul by the match commentators this evening. Fantastic victory by our lads today. We were the better team throughout I thought and certainly played the better football. Although our defense did struggle when those big powerful Derry lads came running through the middle so that would be a worry for the next day as Kildare are also a big powerful unit from what I saw of them last week. Lucky in the end to come away with the victory when those couple of Derry sitters somehow failed to find the back of the net in the final few mins. We did miss a few great goal chances ourselves in the first half plus the missed penalty probably evened it up overall on that front. Lambert was my MOM also but Mclaughlin was just top class also. Have to say our full back O’Malley did very well overall on that giant of a full forward. Exellent performances also by Conor Diskin, Jordan Flynn, Tommy Conroy. After a great opening half Ryan O’Donoghue really faded in the second half. His penalty effort was poor. Colm Moran did not get into the game much either. Credit to these lads for showing great courage and heart throughout. Really impressed with how composed they remained on the kickouts in the dying minutes when the momentum had swung Derrys way. Mayo teams of old would have choked in those circumstances. What a manager Mike Solan is in the way he gets the best out of his players. One question though : where were the tens of thousands of those bandwagon bullshitters of the past six or seven years who have been claiming all along on the various on-line forums to be “real” Mayo supporters??? Fair play to the lads. Can’t wait for the 5th. Great to be in Carrick today after missing last 2 qualifiers. Won’t go into the flaws of this team just yet. Instead, I relished the total football they played. In the last 3 minutes alone, they just couldn’t be stopped and played Derry off the park, when your gut instinct said ‘hold it up there, possession, possession’. No, just football, football. Blinding pace all over, team really comfortable on the ball, some great fetches!! And they go for the jugular whenever and wherever they can. In fairness to our full back line Brian OMalley only conceded one goal to his marker. That’s despite him giving up about 2 stone to him. Johnny Maughan was taken for 2 points from play, again nothing to be distraught about. Cunnane had a good game as well. Be careful what you wish for. If we drop a sweeper back the next day there will be less players to put pressure on the ball outfield. I admire the way Solan sends his teams out. Positive man on man football is the best way to develop players. To win just once, What were you expecting from Roscommon? They are the luckiest team to get to the super 8’s but the problem is such luck brings its own drawbacks. Roscommon are about to discover them. Well done Mayo who’s tessie Dolan ?? Good support may have been the difference that toppled the result in our favour today, but definitely work to do before any silverware goes west. Mayo finished strongly and that was to their credit and supporters who rooted behind them. Close analysis of game required and need to take game to another level for final. No room for any complacency that’s for sure. Strong bench also encouraging. Well done young fellas, well done. I watched a few bits of the other semi final there today and one thing struck me about the kildare lads and that’s their size. A few really big units there alright and I think Kerry were a bit cocky also. Any idea when the venue will be announced? Great day for Mayo football. Well done girls and boys. Unfortunately I wasn’t in Carrick, but watched the girls. What performers. What super swerves and solo runs at speed. Congrats and thanks to all involved. Up Mayo wherever you go. Let’s tell them(as Martin Mc Guinness famously said) we haven’t gone away you know!!! It’s shocking this game has been fixed for Croke Park on the 5th of August.Our County Board need to grow a pair of Balls and demand this game be played at a Neutral venue ie the Hyde or Pearse Park. 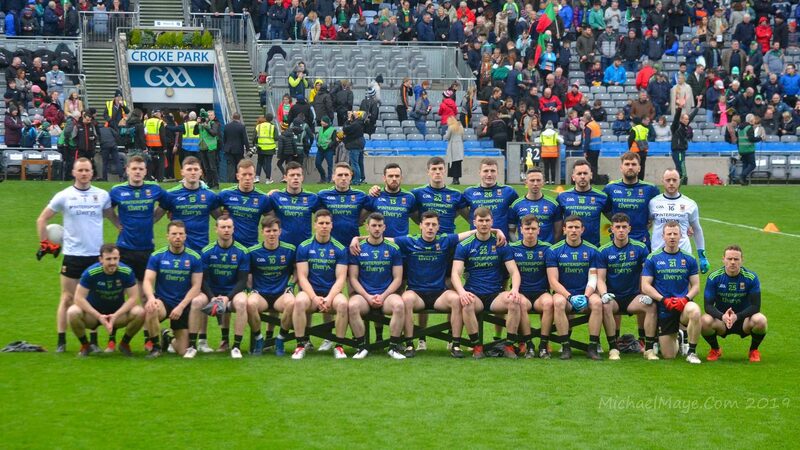 To expect Mayo fans to travel to Dublin and fork out 30 Euro’s to be a curtain raiser for a dead rubber match in the so called Super 8’s is wrong in my opinion. Yes I was in Carrick on Shannon today and what a gritty performance our lads put in. Mayo fans to be milked by the GAA heirarchy is a step to far. Good win today. Two areas of concern – similar to Connaught final only one of the starting forwards scored a point from play – with Tommy Conroys two late points. Derry created at least six good goal chances. Kildare full forward line thier strongest line. We will have to provide better protection/cover for full back line in final. But we are there and this is the first game these lads have played that has gone down to the wire – this will stand to them. Alot of that Kerry team will be in action against Galway tomorrow. That may well explain Kildare’s win today. Provided we don’t too much for granted we may well have something to celebrate on August 5th! Well done to the lads, the management and the backroom team. Great boost today. Also with the ladies doing the business too! Up Mayo! I am delighted for the U20’s and Ladies. I am now going to go off point. I noticed from today’s senior matches, the low turn out of supporters in Hurling and Football. if the supporters don’t come. I also think Mayo ( and Donegal and Kerry) should not be asked to play at 7pm in consideration for the traveling fans. Yeah, we’ll need to really tighten up at back v Kildare. They are a very strong team. Anyone who bests the dubs and Kerry have to be very good. That being said, we are very good too. Just need to be less naive in defending…and not allow teams run past us so easily. If you have to foul do it our near the sidelines. Be cute about it. We weren’t today. Derry had 4 or 5 goal chances in 2nd half. There didn’t appear to be much of a system to our defending. It was chaotic and last ditch at times and while this can look brave and hero like, it’s not the best way of doing it. We moved the ball well from defence to attack, quicker than Derry did and Croke Park should suit quite a few of our players like Lambert McLaughlin Conroy and ODonoughue. On reflection I think our forwards have plenty of room for improvement. Quite a few did some good individual things but they didn’t exactly click as a unit but it’s in them to do so. They have the ability and pace. I though there were a couple if times when lads needed to be more ruthless and aggressive. It’s great that these lads get another 3 weeks together and good for their development and maturity to get to All Ireland Final and experience Croke Park. I think us reaching the final haw alreadt given a boost to morale. Winning it would be very timely given our early exit at senior and I’m not too happy with Galway winning their fourth minor in a row. Mayo fans need to get to the final. I was sure we would have had 3 or 4 thousand from Mayo there today. Did we even bring 2000? I must say that those who did go were very vocal and really drive the team on in the final quarter. Yeah. Clare v Wexford in a hurling quarter final had 10,000. A disgrace. Watch how few travel from Kerry and Galway for their game. Mayo not been there is a disaster for the whole country. Also a huge percentage of classic enthralling thrilling games since 2012 have had Mayo involved in them. If you take Mayo out of it there is not a lot left except poor matches in empty stadiums. Good luck. I notice from a previous owl thread that Backdoorsam has joined the “owl” club. That’s 4 members now. Plenty of room for more. I think you are wrong there citog? Few of therm are surely final year u20 like McLaughlin and Ryan OD, Johnny Maughan. No citog, a fair few of them will be overage next year. South Mayo Exile – Nathan Moran and Conor Diskin also got a point each from open play. We can still improve in the forwards of course. Ryan O’Donoghue creates so many scores but needs to work on his own finishing. He missed one gilt edged point chance in the 2nd half. Well.. Now… G, Mc.. How right you are.. The CCCC whom John Prunty is a member of and party to who decides where and when match’s are played.. Do you know how much John Prunty is paid by the GAA?.. The (possibly soon to be abandoned, Super 8)has got off to an appalling start, Galway and Kerry will kick off/throw in at the same time as the biggest single event in World Sport (the World Cup final,)… Neither County noted for actually giving support to either county… The lunatics are really running the asylum… The GAA are going to find out just how much they will miss Mayo… (not so much the senior team, but the supporters, who have been bled dry by a greedy cohort of Me Féiners)… Kildare and Mayo might be the only competive fixture. WJ I see my comments not making the board? Not sure why? Didn’t know telling the truth was against house rules. Your comments will make the site, JC, if you cut out the trash-talking. It’s perfectly okay to make critical comments – and there have been plenty of critical contributions posted here of late – if those criticisms are voiced in reasonable language and are at least in some sense constructive. Carping and moaning doesn’t really cut it here and calling that kind of stuff “the truth” doesn’t much help either. Venue was fixed since start of the year. I spoke to two of the Mayo team yesterday evening and get are absolutely delighted to be playing in Croke Park. Great day in Carrick! We really do have some fine young players who showed class and courage yesterday. Fair play also to Solan. Hes good! I think we should have won by more if we didn’t waste a few great scoring opportunities in the first half by going for goals when points were the best option. That’s one definite area for improvement before we play Kildare. It was amazing how Derry didn’t bring Callum Brown out the field earlier in the game! Thank goodness for that. Some of these lads need to be brought onto senior panel and developed over the next couple of years. And we need to be patient with them. It was a great afternoon in Carrick. Sure, there are holes and lessons to learn, but this is an U20s side. Something I kept having to remind myself. I thought it was a good Mayo turnout and no doubt we got behind the team when they needed it most. I’ll travel to Dublin for the final and agree with other posters, it’ll be the only competitive game on the day. And like the others, not keen on paying big bucks for the privilege of being the curtain raiser…but glad the young lads get a run out on the hallowed turf. They have earned it. Brilliant win. Lovely team. Some terrific potential. One thing though, if we are brutally honest. Why is Ryan taking penalties? It’s obvious to me he’s just not very good at them. Therebhasbto be a better taker in the first 15! He has taken 3 in 3 games and they have all been dreadful! Missed 2 and the one against Ross went in but it was an absolute shocker!! Also, with some of the footballers Westport are churning out , they will be making a serious assault on the Championship very soon. These lads also in very good hands there which bodes well. This U20 team is a lovely team. It’s very exciting. Onwards to, another, All-Ireland Final! Up ya boya!! For the club championship this year, Westport could have a half back line of Lambert, Leeroy and Oisin McLaughlin! I wouldn’t fancy either Paul or Oisin has senior defenders. They are best running at defenders and half back line too deep to make frequent runs. Also leave big gaps behind them and difficult to recover quickly enough to defend again after these high energy bursts. It will be interesting to see where Horan positions them. Put our Mayo FB line, particularly corner backs, under pressure as they had the dilema of leaving their own man to close down the player attacking them. Just watched the game again, Mayo were a lot better than the 3 point winning margin, had their decision making been better they could have won by 6 or 7. O Donoghue appears to have a bit of an X factor about him , could be a big player in future with the right coaching. Jay I agree. We had the man in possession running into trouble and losing the ball on numerous occasions when it should have been laid off. We need to be smarter with the ball in possession. The willingness and fight to get the ball back is great to see. Paddy pulled off 2 great saves in the second half but kick outs were a problem for a while. It really does appear that this super 8 structure is one of the worst moves the gaa has ever had. A series of mainly dead rubber games. Roscommon hammered by not even the top team in their group. Where is the appetite now for the Rossies to turn out in big numbers for their remaining games. Someone mentioned the crowd for the hurling yesterday which was low as well. The oomph has been truly taken out of the championship. God be with the days when it was a thrill to reach croke park. Mediocre teams getting to play there now and nothing against them getting to play there, but dragging counties up there to be handed a shellacking isn’t going to grow the game in any way. The longer this super 8 is left in place the more the fan numbers will dwindle. It’s no coincidence that it’s galway and kerry today at 4 and not the Dubs. The Dubs would have kicked up a rumpus if timetabled to play the same time as the world cup final. The Dublin gravy train rolls on at a speed of their own choosing (not their fault, the gaa’s), while the football championship dies a slow death. I really enjoyed the game in Carrick yesterday. A great win and some great performances . Helps to lift the gloom a bit. Expecting a far bigger crowd but those of us that were there really supported the lads. Backs need to improve, but we must remember they are only young fellas. It’s great for the players to get an opportunity to play the final in Croke Park. Although they never played there before with county, most would have happy memories from Ballinrobe CBS and Westport Inters last year. Will be hard to get any sort of an atmosphere there unfortunately. Even 7 or 8 thousand fans would be lost dotted around Croker. Made the trip to Charlestown for the MW League Semi Final against Knockmore. The visitors were short a large number of regulars including Rice, Walsh, McHale, Ruddy and McLoughlin. Charlestown short Towey, Reilly & Lenehan. Charlestown are vastly improved from earlier in the year and I was really impressed with Paddy Goldrick in the middle of the field. I think this lad is a future county star if he is nurtured. Lovely stride, competitve spirit and one beautiful outside of the boot point. Interesting point ontheditch. Hard to know at this stage where they’d fare best at senior. Both have wonderful attributes that could suit either line. Oisíns running yday was a joy to behold. Both are great decision makers too and have a maturity about them and both stood out when it mattered. That is the key thing for me. Hopefully it will be a good dilemma to have! I think a benefit from them playing deeper is that they can control more of the play and tempo. Something they might not have in half forward line. They are players who always want the ball and want to be involved. Of course we are in need of players with such attributes in the forwards too so it could work either way. They are still young so loads of time to see. No better man than Horan to help them grow and develop even further and to see where they are most effective. There’s no doubt we’re so blessed with half backs generally in Mayo. I was surprised Akram didn’t see more game time with the seniors this year. He’s a terrific talent and should get a real chance. I heard he was brilliant for Ballagh in recent match. Fair point Liberal role. But I do think if they are employed at half back in final, then those runs will be even more draining. But good understanding with half forwards who would cover for them so that they are not expected to trek back immediately would give them that freedom. We were just that bit of a team of individuals in carrick. As you say also they will be well guided by Horan and it is very hard to combat pace coming at you. Great believer in Akram also and he has Andy Moran to guide him at Ballagh. Agree with you too about game time given to him. I remember distinctly one game he did not even touch ball when introduced. The encouraging thing at the moment is that the potential talent is in the county. Well done to Redcol on unerthing possible full back in kking and midfielder in pgoldrick. Joe Dawson played for UL in midfield with Brian o Malley will be around next year and a great sub to have. Same with Sean og Tigue who had a positive influence. As always there is questions why this player didn’t make the squad or that one, Mike Solan to me doesn’t go on reputation and picks players even from unfashionable clubs Cathal Slattery Evan Ronane top underage forwards at clubs and college level but for both Michael Conroy from Davitts is a selector and Slatterys coach at Ballinrobe CS is also a selector so to me these decisions were on merit or as with some self made. I read last week that Pat Lambert decide to concentrate on the leaving very when he was in the panel. Like JP and a few others are saying all year the future is brighter than you thing. A lot of these players are underage next year add in th Rice contingent if the younger version of the Lambert Mclaugjlin and Moran, Slattery and Ronane Ballaghaderren Dean Darcy and Kuba Callaghan, Charlestowns Paul Towey and Paddy McGoldrick to come in. Cathal Slattery was in the panel early in the year and unforunately had a lot of trouble with a hamstring injury at the time. Just one of those things he got injured at the wrong time. Very hard to bring someone back in after a Connacht Final. I dont attribute any blame to player or management just the way things worked out. To add to the general mood of optimisim, Paul Towey from Charlestown was on the U20 panel this year but left to concentrate on his Leaving Cert. He’s still only 17, has two years left at U20 grade and according to most inside the camp he would definitely have been on the panel this year. He’s kicking the lights out at senior level for the club and is one of the most exciting prospects the club has had in a long time. Add in Paddy Goldrick and Jack Mahon and you suddenly have a lot to be excited about at club and county level. The East Mayo A minor final is on next Friday between Charlestown and Ballaghadereen, if anyone can get to the game they should. There is some serious talent between the two teams. These things are cyclical but East Mayo will be strong again in a few years. Where and at what time is that game on next Friday, Liam? Small chance I might be in the locality then if it’s on in the evening. I would say the same happened with Gavin Durcan Castlebar. This scheduling of this age group wasn’t well though out in regards to the leaving cert. It is great to se clubs like Parke making the West Mayo A final 2 years in a row Balla won the County minor last year. As far as I see Cillian Golding was the member of both of these clubs to make it this year. I expect to see a greater infusion next year. 2 years make a massive difference in club level never mind county level at underage. We should never write off a team before a ball is thrown in. I loved the fighting spirit of this team, well coached I have to say. Solan and hopefully Morley given time are on the right path. No venue fixed yet WJ, I’ll post here when they come out. About the only thing keeping Jim Gavin awake tonight is where to book for the team holiday. Well done to Galway, but Kerry were a shambles. If we rest up, regroup and bring in a few fresh players there is no reason we won’t be back at top table next year. Tyrone v Galway and Monaghan v Dublin looking like the semi finals. The reckoning in Kerry will be brutal…. This Super 8’s crack could turn out to be a wake up call for the GAA heirarchy. Bringing counties to Croke Park as a neutral venue is all wrong as we have seen this weekend with attendances. To grow the game we need to be using provincial venues as much as possible so kids and families can see there heroes playing at less cost. Imagine Tyrone V Rosscommon in Breffni Park and Donegal V Dublin in McHale Park yesterday. Today Kildare V Monaghon in Navan and Galway V Kerry in Limerick. Better atmosphere and money entering the local economy. Next weekend will tell a tale or two to see if this is possible.